Today, we are talking about marketing to potential customers. By this point, you have practiced your quilting, developed a plan and are now ready to bring in the customers. The big question is: How do you do that?? When I started quilting for customers, I wasn't sure how to go about it. I printed some business cards (they were so horrendous!) and decided it was time to get out there. I joined a local quilt guild and a quilting group and started attending meetings. Soon, I heard that the guild was having a quilt show and was allowing vendors. So, I decided to be a vendor. Looking back as, it is so laughable. I had a quilted sample and some business cards and that's it! I am so sure that I looked out of my league. I worked my "booth" all weekend to no avail. I left the show with no new customers and no idea what I was going to do. As I continued bringing quilt samples to the guild meetings, I began to pick up more and more customers….and the rest in history! So what can you do to pull in more customers? Here are a few tips and pointers to get you started on your way! 2. Always carry a business card. You are now in the business of selling yourself and you never know when the opportunity will arise. I have handed out my business card at a grocery store before! If you already have a customer or two, ask if they would like to have a couple of extra cards as well. Word-of-mouth is the best advertising, no doubt about it. Don’t be afraid to ask your quilting friends and customers to pass your name along. Even as you grow your business and pull in more customers, be active about asking for referrals. A great book that I read on this is called The Referral Engine. A lot of people might feel uncomfortable doing this, it can feel a lot like being a “salesman”. But it doesn’t have to be scary. It can be as simple as a handwritten note, thanking them for their business (or friendship) and mentioning that you would love for them to keep your name in mind should they run into any one needing quilting services. Just because something works for other quilters, doesn’t mean that you have to do them as well. Read books about marketing and advertising and see how you can apply the suggestions to your situation. One book that I read and used a lot was called Guerrilla Marketing for Free. (Can you tell that I love reading business books??) Also try to think of unusual, creative ways to make yourself stand out. 5. You just need one! It can be disheartening to put yourself out there and not see a return, or you might not grow as fast as you think you should. Don’t be discouraged!!! You only have to find that one person, the one person who tells their whole quilting group about you. Networking is a lot like branches on a tree, each lead eventually branches out to more and more customers. But enough rambling from me! How about an expert’s opinion? For this week’s interview, I have asked Heather Grant to share some of her marketing savvy. You may know Heather as the blogger behind Modern Day Quilts, but that is just the tip of the iceberg. She is a business consultant and has worked with authors (myself included), businesses and even the Modern Quilt Guild. She is brilliant, just brilliant. When I was first quilting for others, I felt the need to discount my quilting in order to pull in new customers. If we could go back in time, what would you say to me about discounts and coupons? · Partnerships – if your LQS doesn’t have a long-arm machine, consider partnering with them. For example, LQS customers who spent $75 or more get 10% off quilting when they show their receipt. In return, the shop will put your business card at a visible spot near the register. Tell your customers about this deal to help drive customers to the LQS and make it a win-win for both of you. · Referral Discounts – if a current customer refers a customer to you, you offer a discount to the customer. People rave about this. I had a hair stylist who offered a free haircut for every 3 clients I referred. I kept talking about him, because not only did I love his work, but I loved the free haircuts! How much research and preparation should someone do before they start marketing to potential customers? What items should they be researching? I don’t think any small business should start without creating a basic competitive analysis. You want to know what you competitors offer. It can be a simple spreadsheet with the competitor’s name, price, style, pros, cons. Look at this analysis and see what differentiates you. Make sure it isn’t just price. Is it your customer service? 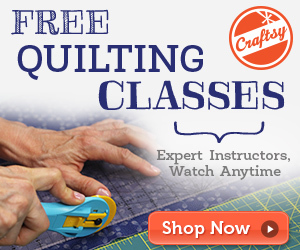 Do you specialize in a certain type of quilting? What makes your offerings unique? Is there a long-armer who is well-known in your area for what you want to do? If so, you may consider adjusting your focus. Revisit this spreadsheet every six months to see how your competitors are doing and make sure you are still differentiating yourself. The second thing to consider is your target market. It is really easy to say that you want to target all the quilters in your area, but when you do your competitive analysis, is there a certain type of quilter no one is fulfilling the needs for? How will you market to each different type of quilter? Modern quilters are looking for something different from traditional quilters. They can both be in your customer base, but think about the messages you say to each of them. What tips would you give someone who is trying to attract new customers? Be cautious in offering your work for free; make sure it has a quantifiable return. Be willing to fail cheap, both in money and time. Your customers are your bread and butter. Network in your quilting community, focus on personal attention and word-of-mouth should follow. 54% of purchasing decisions are made from word-of-mouth references*. Make a goal that every sale should generate a lead or referral. But wait! That’s not all! Heather had so many suggestions and tidbits, that I couldn’t fit it all in a blog post! She graciously allowed me to interview her via Skype so that we could get even more marketing advice. Next week, I will be back with another interesting topic….How to figure out your pricing. In the meantime, Happy Quilting! Angela, thank you so very much for sharing this blog and information. I just purchased a 17″ machine and frame and have friends who want me to quilt their quilts. I have no idea what to charge as I am seeming to fall into this business. I of course want to do it with an educated estimate for them and this is most helpful. Thank you again and I look forward to continuing to glean from your experience and posts. Angela, thank you so much for sharing so generously this type of information! I have just bought an Avante and while quilting my own quilt, there is a thought at the back of my mind, that I probably would not mind to try to quilt someone else’s quilt. But I do not have confidence to offer my quilting services – even though my quilting club friends would be happy for me to quilt their quilts for them. I am just not sure how I would start. Love this and I’m looking forward to each new tip!!! Hello Angela, What a wonderful website for us who are trying to do what you do!! I have been a dedicated follower since the day I decided to buy a longarm machine (2.5 yrs ago). I retired from the Air Force 2 yrs ago after serving 29 yrs. My main career path was medical/nursing but I spent the last 10 yrs of my career as a teacher/instructor/Dean and curriculum developer for several medical careerfields. I have been quilting off and on for nearly 13 yrs, mostly as a hand quilter, and started machine quilting 3yrs ago. During those 3 yrs I practiced, practiced, practiced, and about 7 months ago felt confident enough to start taking customers ( I would like to send photos to get your critique ;-). I researched and bought books on quilting as a business, developed my pricing method, created business cards and even a logo, and joined my local quilt guild. My son encouraged me to use socia-media to display my work so I created a instagram page (Quiltfabulous), and a flickr page (fabric nista). I’m currently working on a facebook page and website (time is hard to find when you work full-time and take MBA courses). My long-term goal is to own a quilting studio with 3-4 longarms in which I could teach others longarm quilting. I have quilted 13 customer quilts, and loads of charity quilts for my church and Quilt for Kids Inc. I was also selected to quilt a charity auction quilt for my guild. Ok, enough of me…let me state my concern, I have gone to a few of my local quilt shop to try and gain business by quilting samples for them or have them display my card so that its available to customers seeking quilting services. What I have notice is that quilts shops (that have the room) are now buying longarm machines so they can provide rental services to their customers to quilt their own quilts. Although this is a great move for the quilt shop to increase profits, how do I as a home-base quilter stay competitive and market myself in this new trend? I consider myself a well-rounded quilter but my nieche is semi-custom work, and ruler work. So much great information. Definitely will have to go over these again. And the added Skype interview was well worth the watch! Hello Angela! You are an angel sent from heaven to start such a fanastic website!!! I have been a devoted follower since a little over a year ago when I bought my longarm machine. I have diligently practiced, practiced, praticed, and am now pretty confident in my skills (I would like to send some pics to get your critique). My ong-term goal is to become a full-time professional quilter and own my own studio with 3-4 longarms to teach others. i retired 2 yrs. ago from the Air Force after serving 29yrs. I have over 10 yrs. in teaching/instructor and curriculum development. My career path was in medical/nursing/administration during my military career. I have been a hand quilter off and on for 13 yrs. and did not start machine quilting until 3 yrs ago. Ok, enough about me…let me get to my issue ;-). Before I started taking customers, I researched and bought books on machine quilting as a business. I decided on the method for my pricing, created an invoice, created business cards, and even a logo. My son encouraged me to use socia-media so I have an instagram page (Quiltfabulous) and a flickr page (Fabric nista). I’m in the process of creating a facebook page and website. I have done about 12 customer quilts, lots of charity quilts for my church and Quilt for Kids. I joined my local quilt quild chapter and have done 2 special charity quilts for them and of course I bring my quilts to “show and tell”. I have started to go to local quilt shops to see if I can get business there. i have my cards in a few stores, but what I’m noticing is that the quilt stores are now starting to buy longarm machines and rent them out to customers. Do you have any encouragement as to how I would stay competitive in this new trend? I would consider myself a well-rounded longarmer, but my nieche is semi-custom work and ruler work. Your thoughts on this is greatly appreciated ;-)! !